standard. There are plenty of vacancies available in SCERT of Chhattisgarh. To fill all the vacancies the government of Chhattisgarh is going to conduct the CG TET Exam 2017. Eligibility criteria having candidates may submit their applications online through the official website of CG Vyapam on or before 27-11-2017. In estimation more than 5 lakhs of students are going to attend this CG TET Exam 2017. For more information regarding this CG TET Exam please see the details provided below. Admit Card/Hall Ticket downloadable from 7 days before the exam date. Chhattisgarh SCERT has been released notification with Vyapam Board for CG Teacher Eligibility Test -2016 Exam for filling the available vacancies in Chhattisgarh schools. Eligibility criteria having candidates apply online from the dates 07-11-2017 to 27-11-2017. Details for CG TET Exam-2017 education qualification, exam syllabus, age limits, selection procedure is given below. As on 01-01-2017 the candidate upper age limit is 45 years. Please verify the age at the time of online exam application. Those who are having graduation they must have 2 years B.Ed in respective subject from a recognized university. The candidates have to pay the exam fee through the SBI e chalana or Using Debit/Credit card or using Net Banking. First Paper (For Classes I to V) Primary stage exam will be conducted for 150 Marks with 2.30 hours duration. First Paper (For Classes VI to VIII) Primary stage exam will be conducted for 150 Marks with 2.30 hours duration. Click here to download the exam syllabus PDF for CG TET Exam 2017.
from 07-11-2017 to 27-11-2017. Before applying online please read the official notification carefully and download the Image upload document and paste the photo and sign on the given box and paste the thumb impression and then scan below 50 kb size and upload it to the online examination. Then complete application form and also provide valid mobile number and email Id. 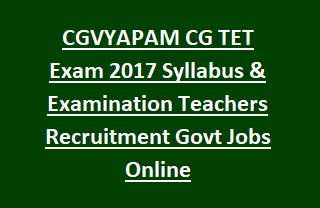 Click here to apply online form CG TET-2017.